The 2014 Mountain Bird Festival was a huge success. All attendees served as bird conservationists by helping raise over $10,000 in support of local and national conservation efforts and the science that drives that conservation. 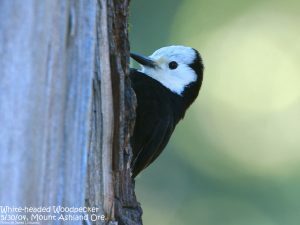 Participants flocked from all over the U.S. to bird the Klamath-Siskiyou Bioregion of southern Oregon and northern California. 171 bird species were seen by festival participants, including mountain and pacific northwest specialties such as White-headed Woodpecker, Spotted Owl, Calliope Hummingbird, Mountain Bluebird, and of course, the Great Gray Owl. Additionally, over 90 species of wildflowers were seen in bloom, as well as 21 species of dragonflies and damselflies seen zipping through the region’s diverse habitats. All data from field trips were entered into eBird Northwest, which contributes to our understanding of bird distribution and habitat use. All festival attendees purchased a Federal Migratory Bird Hunting and Conservation Stamp (a.k.a. the Duck Stamp) with their registration, contributing to wetland restoration and conservation throughout the United States; attendees also purchased a Conservation Science Stamp, supporting Klamath Bird Observatory‘s worldwide efforts to advance bird and habitat conservation through science, education, and partnerships. 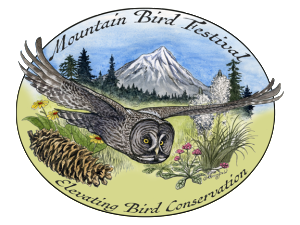 The 2015 Mountain Bird Festival will offer guided bird walks, fine art galleries, local wine, microbrew, and food vendors, and a feel-good community atmosphere. This year’s keynote speaker will be Cornell Laboratory of Ornithology’s International eBird project leader, Brian Sullivan. Brian will show us how eBird and its state of the art technologies are revolutionizing birding, making this popular recreation a powerful conservation science activity. Festival registration includes half-day or full-day field trips offered on both Saturday and Sunday. Festival goers will have the opportunity to enjoy all that is offered by the town of Ashland, Oregon. See a play at the Oregon Shakespeare Festival, stroll through town to visit a variety of shops and galleries, get a massage, or enjoy a meal at one of Ashland’s many restaurants that feature local foods. We look forward to seeing you at the 2015 Mountain Bird Festival. Click here for registration, now available on our website. Click here for the festival flyer. Click here for a list of field trips. The Klamath Bird Observatory is grateful for your support and dedication. Don’t forget to tell your friends about this great opportunity to see wonderful birds and contribute to their conservation while at it!